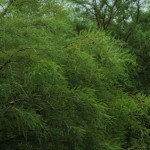 The Bald Cypress has feathery like foliage offers a nice soft texture in the landscape. 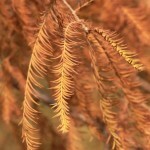 In the fall the light green foliage transforms into a burnt orange. 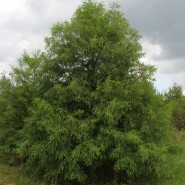 The Bald Cypress can tolerate drier conditions but this beautiful native conifer is commonly found in low land areas where there is a lot of moisture. When planted in wetter soil conditions the roots from “knees” the stick out of the ground when in drier conditions they do not tend to form them. Making this a very adaptable native tree. Even though it is a conifer, it is one of the few that are deciduous meaning that they will drop their needles in the fall. 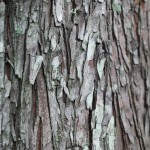 In the winter you are left with their beautiful structure and cinnamon colored bark. Growth Rate: Average. Form: Upright, pyramidal. Height: 50′ – 70′. Spread: 20 – 45′. Exposure: Full sun to partial shade.